Thereâ€™s a definite trend right now towards small but rich chocolate candies that are packaged to appeal to women and marketed as little indulgences that wonâ€™t break your diet. 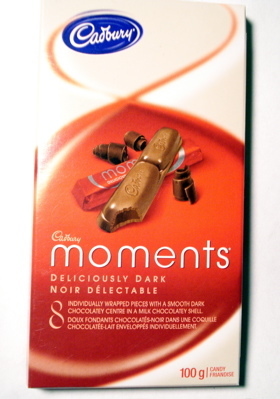 Cadbury has officially entered the arena with Moments, which are essentially two-bite truffles in bar form. With Moments, Cadbury seems to be aiming for the same upscale demographic as Dove and Hersheyâ€™s Bliss. And like Dove and Bliss, they donâ€™t come cheap â€“ I paid $3.50 CAN for the pack. Thatâ€™ll buy you a bar from some pretty upscale chocolate companies. So how does this higher-end product from a lower-end candy company stand up? First, the specs: Moments consist of little sticks about the size of a fun-sized Kit Kat, tucked into a cardboard â€œenvelopeâ€ that opens from one long side, like a box of cigarettes. (Hmm, somehow I doubt thatâ€™s what Cadbury was going for with this product.) Each stick has only 70 calories, which puts it well within range of that whole 100 calorie thing thatâ€™s so big right now. Of the three flavors on the store shelf, I selected Deliciously Dark, the other two being milk chocolate and praline (the hazelnut kind, not the toffee kind.) Under the wrapper, the bars consist of two little segments, attached end to end, and they sure donâ€™t look very dark to me â€“ it seems that only the truffle filling is dark chocolate, which was kind of a letdown to a dark chocolate junkie like myself. The chocolate is very sweet, tangy-tasting and quite milky, as Cadbury chocolate tends to be, and as predicted, Iâ€™m just not getting the dark chocolate. Texture-wise, they remind me a lot of Lindt Lindors in stick form â€“ a firm outer chocolate shell with a very buttery, borderline greasy filling. Like Lindors, they have a lot of oils in the ingredients, which I guess is necessary for a truffle filling, but is still a bit of a disappointment in a product this pricey. They have less filling than a Lindor, but theyâ€™ll leave you with the same â€œI just swallowed a pat of butterâ€ feeling in the pit of your stomach. The tanginess of the milk chocolate helps to cut down on the greasy mouthfeel, but itâ€™s a shame that they didnâ€™t go completely dark like the dark chocolate Lindors, since the bitterness of the darker chocolate changes them from oily to voluptuously rich. Theyâ€™re decent, as long as youâ€™re not expecting really dark chocolate, but not really worth the price. If you like truffles and dark chocolate, go for dark chocolate Lindors instead – from a company that knows how to do dark chocolate properly.